We create and release these ratings to ensure that consumers are informed about what sunscreens work best so they can protect themselves and their families from damaging sun exposure. While Consumer Reports urges consumers to use sunscreen, the organization’s latest tests show that you may not be as protected as you think—and it’s important to choose the right one. In CR’s latest annual tests and ratings of 65 water-resistant lotions, sprays, and sticks with SPF claims of 30 or higher, the organization found that 28 of them—a full 43 percent of the sunscreens tested—tested below their advertised sun protection level. Two of the sunscreens tested, Banana Boat Kids Tear-Free, Sting-Free SPF 50 lotion and CVS Kids Sun Lotion SPF 50, tested at an SPF 8. But Consumer Reports’ testing, which included evaluating the feel, look, and scent of sunscreens, also found good news. Based on the tests, Consumer Reports recommends 17 hard-working sunscreens that won’t impart a greasy or sticky feeling. Consumer Reports included La Roche-Posay Anthelios 60 Melt-In Sunscreen Milk lotion, Pure Sun Defense SPF 50 lotion, No-Ad Sport SPF 50 lotion, Banana Boat SunComfort Continuous Spray SPF 50+, and Equate Sport Continuous Spray SPF 50 in its list of ‘crowd pleasers’—highly rated sunscreens that solve consumers’ biggest sensory complaints. 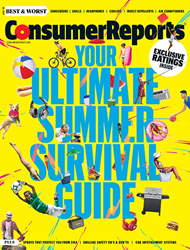 The full report, which features a Q&A on sunscreen use, survey findings on sunscreen use and the complete product ratings, is featured in the July 2016 issue of Consumer Reports and at http://www.consumerreports.org/sunscreens/get-the-best-sun-protection. As in previous tests, Consumer Reports found that mineral-based sunscreens—often referred to as “natural” sunscreens—are far more likely to fall short of their promised SPF. When Consumer Reports looked at four years of its sunscreen testing data, it found that 74 percent of the mineral sunscreens tested did not meet their SPF claim, compared to 42 percent of chemical sunscreens. Testing also revealed that to make sure they are getting a sunscreen with at least SPF 30—the minimum level recommended by the American Academy of Dermatology—it may be best for consumers to choose a sunscreen with a higher SPF on the label. Seventy percent of sunscreens labeled SPF 40-110 tested SPF 30 or higher, while only 65 percent of sunscreens that claimed SPF 30-39 met the mark.